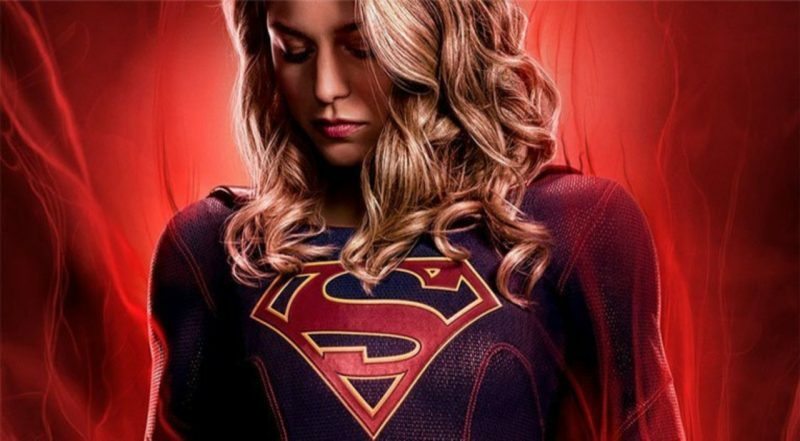 Welcome, fellow DC fans and readers of DC World, to the first Confessions of a DC Geek of 2019. It may have been a while since the last edition but as I’m sure you will all agree, it is certainly always worth the wait. In this edition we have big DC Comics fan, and supporter of DC World, David Armstrong. His love of all things DC will become apparent as you read the article. Therefore, without further ado I give you COADG #19, please enjoy and feel free to comment or on Twitter here or here. And if you would like to take part, see the Twitter links above or the details at the end. DA: Iʼm David and I am 32 years old and from Carlisle in Cumbria. I live with girlfriend of 10 years and our two children Cory & Shay. Currently I am coming up to 4 years working at the Train station as a guard. 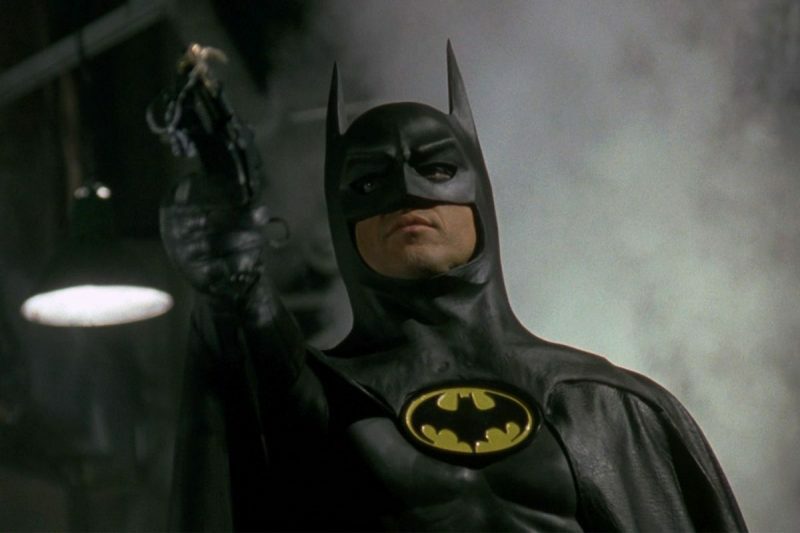 I remember seeing the first Batman movie with Michael Keaton and couldnʼt get enough of the character and I was hooked ever since. It wasnʼt until seeing the Justice League cartoons that I realised they were all under one banner (DC) and Iʼve been a massive fan since. 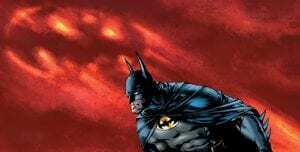 I think I gave that away in the previous question but itʼs Batman. I have a soft spot for most of the DC roster but if it came down to it then itʼs the Dark Knight. Has to be the crown Prince of crime The Joker. 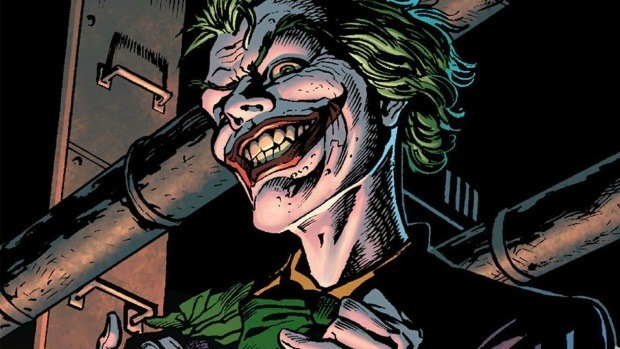 For me the greatest villain in comics. 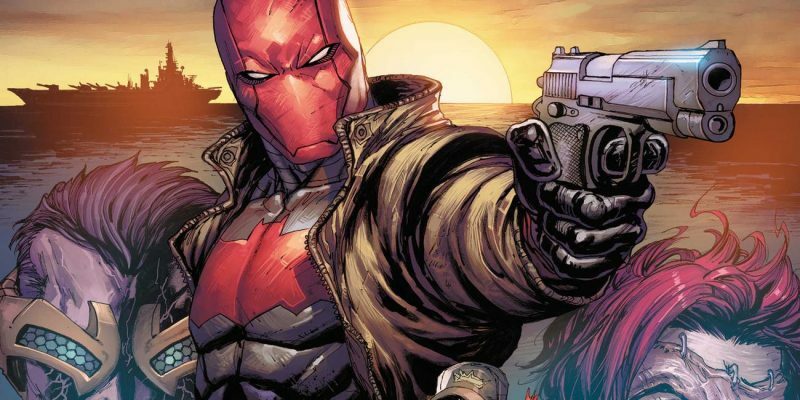 Heʼs an anti hero but I am a huge fan of Red Hood (Jason Todd) and his history with Batman and the Batfamily. Another villain who is a firm favourite of mine is Deathstroke. 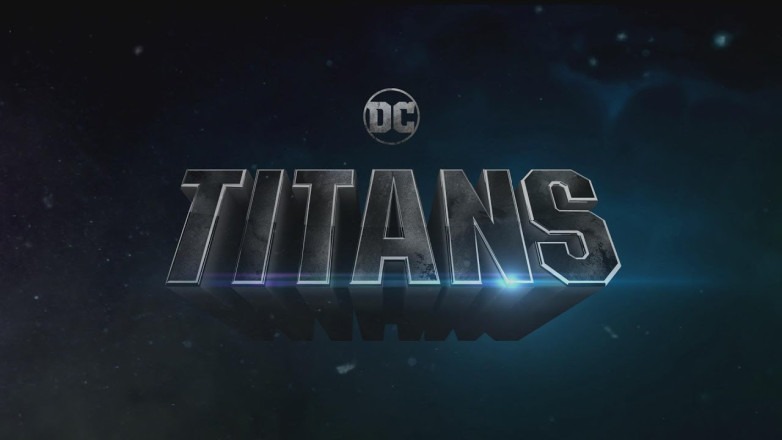 For me itʼs Titans, Krypton and Gotham, itʼs such a shame that the latter is coming to end. 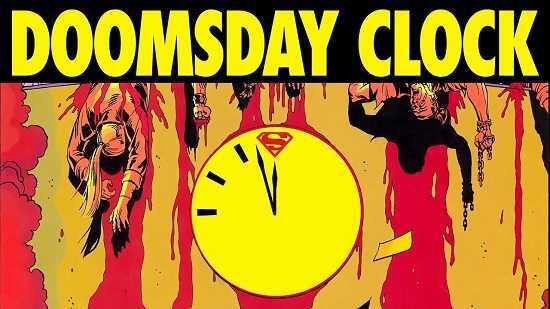 Iʼll have no doubt the Watchmen tv series once that is released will make the list as well. Aquaman. To me it was the perfect comic book movie, itʼs also the first time I went to see a movie 5 times as I could not get enough of it. The whole cast owned their roles and Jason Momoa IS Aquaman. I canʼt not give mentions to Man of Steel which to me is the Superman film Iʼve always wanted and Batman v Superman. 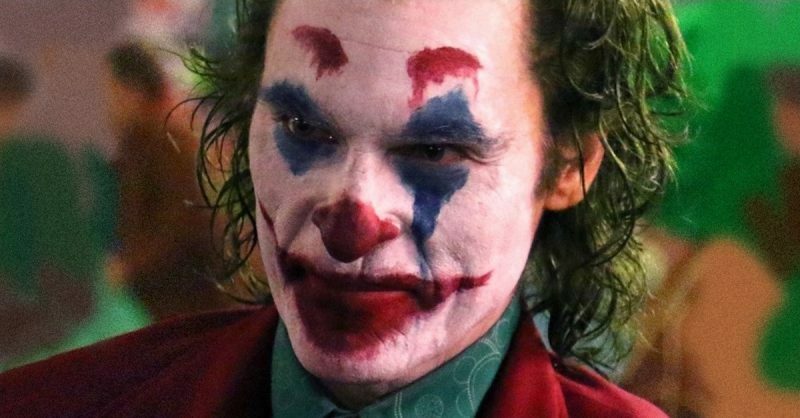 Overall I love most of them and itʼs an exciting time to be a DC fan at the movies with future releases like Shazam and the Joker with Joaquin Phoenix. I wouldnʼt be surprised if my list changes in the future. I think itʼs long overdue that both Red Hood and Deathstroke have their time to shine on the big screen in the DCEU. 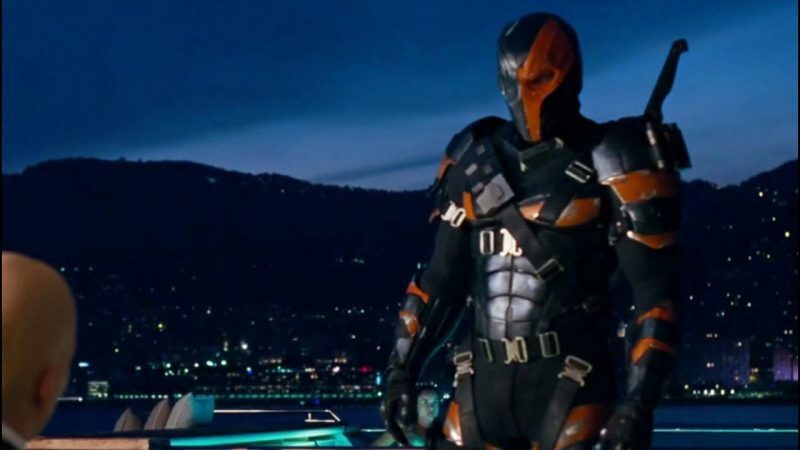 I know we got Deathstrokeʼs cameo in Justice League but to see him in action and actually take on Batman would be a dream come true, they are both fan favourites and would be massive hits with the audience. Ben Affleck as Batman. He was absolutely perfect for the role and to me is Batman. He is going to be a huge miss. Seeing the warehouse scene in Batman v Superman was something Iʼve always wanted to see in live action and in the previous movies have never got. Whoever wears the cowl next has some big shoes to fill. Iʼm currently reading Doomsday clock, heroes in crisis, Shazam and really looking forward to the female furries. My all time favourite graphic novel has to be Watchmen, itʼs a masterpiece. Controversial Q1). We have seen a pre-production teaser from the Birds of Prey movie which in turn has seen a lot of negative comments appear online on social media and various forums. What is your take on this, do you feel it fair to judge a movie that is nowhere near release or do you think all comments are fair game (I know my thoughts about those who judge already but this is a family friendly site)? I think itʼs far to soon to be judging what looked like a costume test and was a little tease for the fans. I have lots of faith in the movie and fans should really wait till we see a proper trailer and then they can judge it better then. Controversial Q2). 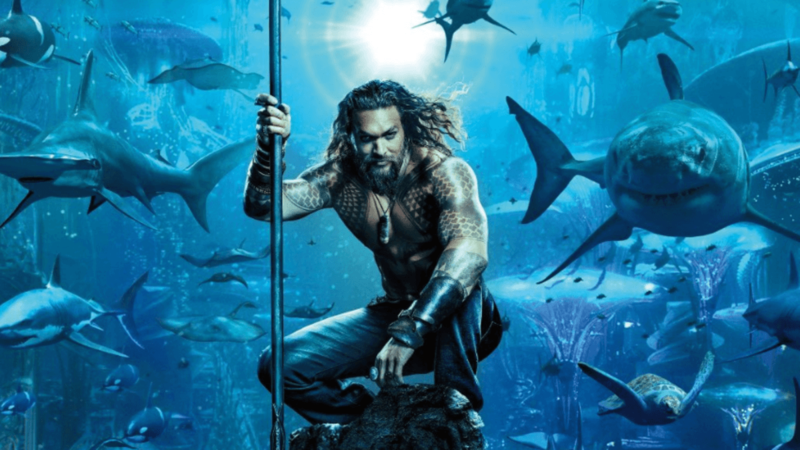 Aquaman – despite its amazing use of VFX and giving us a visually stunning movie (aside from the fact we have Amber Heard and Nicole Kidman starring), the movie has been (criminally) overlooked in the Visual Effects category. As a big fan of the DC Universe, what are your thoughts on this? I honestly do not know how a movie that looked that amazing and I was in awe at some places can not even get nominated, it boggles my mind further when other films which have been nominated, whoʼs vfx look like they are from a computer game get recognised. There is nothing like friendly competition but some fans do go overboard. 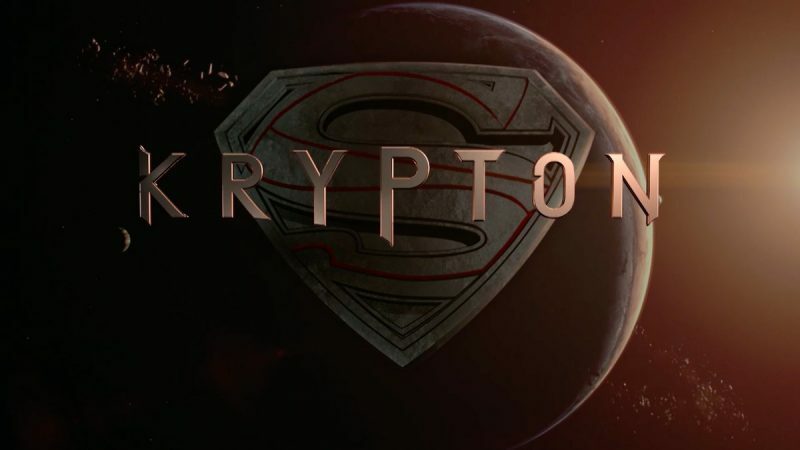 Itʼs a great time to a superhero fan and long may that continue so we should enjoy it without aiming personal attacks at whoever likes what brand. I do think DC is better though of course. I think I would go the anti hero route and Iʼd probably model myself off Red Hood or Deathstroke, so I think my powers would be able in line with them and learn all kinds of fighting styles. I attend my local one where Iʼm from which is Carlisle comic con but have yet to attend any of the bigger ones. Itʼs definitely on the agenda and Iʼm planning on visiting LFCC where Iʼm hoping to meet Aquaman himself Mr Momoa. 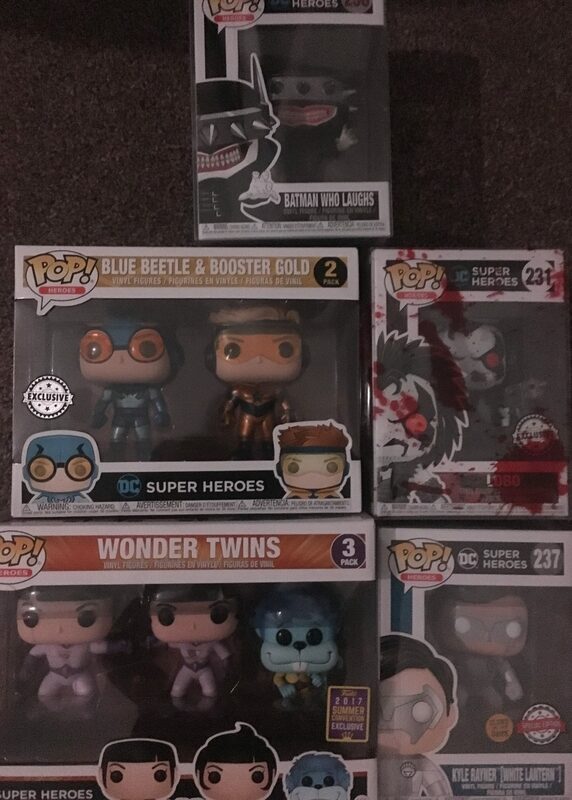 Got to be the DC Funkoʼs popʼs, they are slowly taking over my bedroom and are very addictive. Iʼve also been buying a few statues and recently purchased a replica Batman v Superman Batarang which is so cool. DOf the items you own, do you have a most prized possession? – I’m not asking for your favourite here, but the one/s you cherish most of all. Why does it/they mean so much to you? 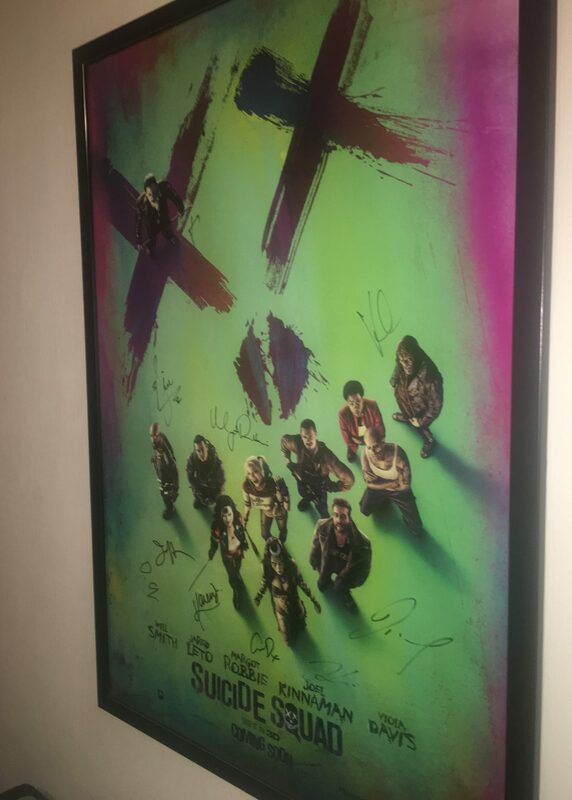 It has to be my signed Suicide Squad poster from all the cast that my girlfriend had got for me. It takes pride of place in the living room. Nothing at all. Will only ever get legit. I think my signed Suicide Squad poster would be the rarest item I own. 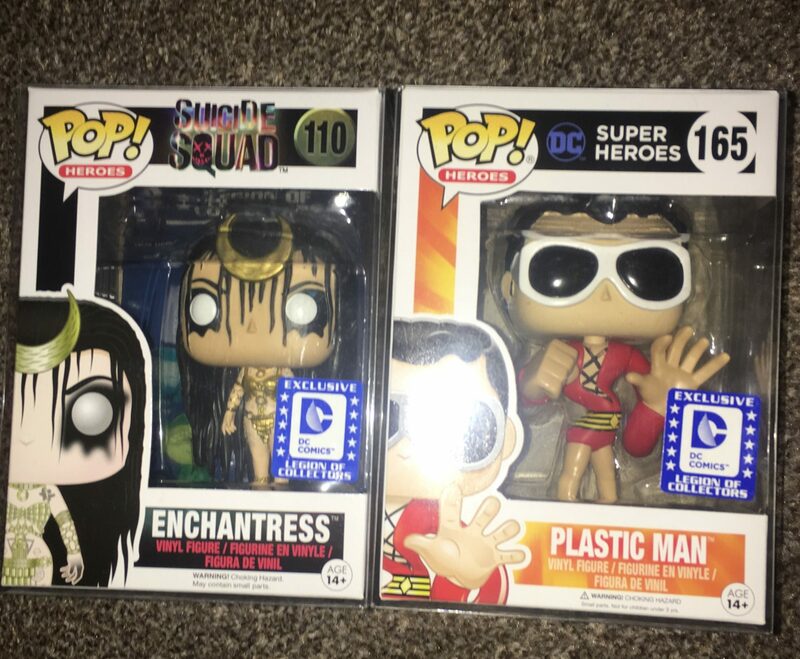 I also have few rare DC Funko pop like Enchantress and Plastic man as well. If it isnʼt my framed poster itʼs my blu ray collection. I currently own well over 500 so I am not short of a movie to watch. Itʼs the overall event. Meeting celebs and getting photos with actors who are favourites of mine, also the merchandise but also meeting the great people Iʼve met on Twitter like the DC World team and people Iʼve had conversations with from our love of DC. The biggest would be the giant toy Batmobile from the Justice League movie and smallest I believe is a Green Lantern replica ring. Has to be a real working Batmobile car. The closest Iʼve got is buying my son a battery powered toy version. 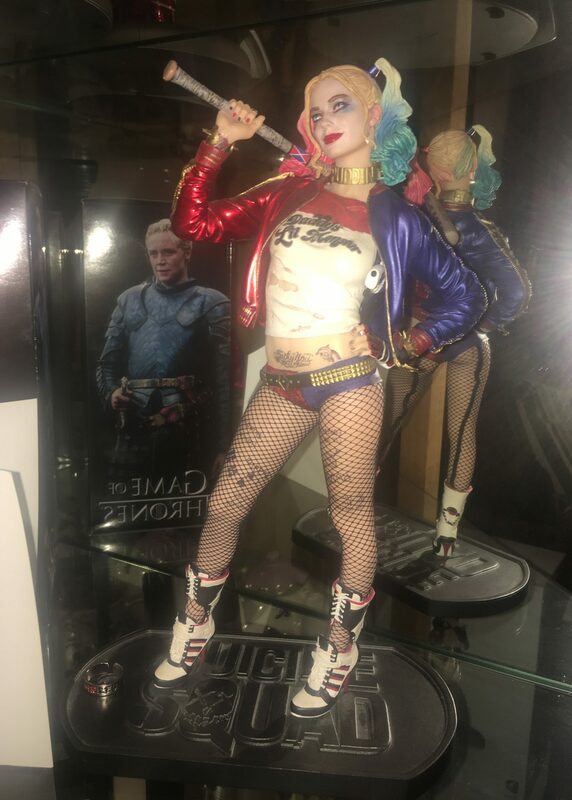 The most expensive would probably be the Harley Quinn suicide squad statue and as for the least expensive it would probably be socks. 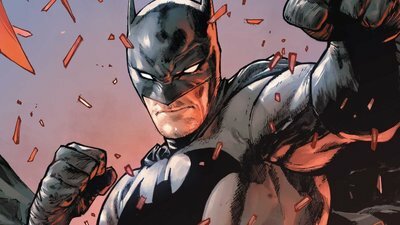 Finally, The BIG Question – away from your confessions and collection, what are your hopes going forward for the world of DC Comics? Please feel free to write about all mediums (TV/Movies/Comics etc.) that you wish. Definitely the movies. 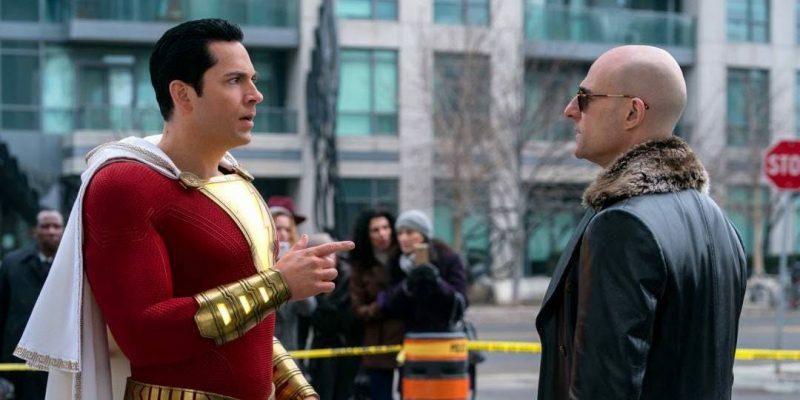 Shazam is up next which looks great and Joaquin Phoenix in the Joker film. Iʼm also hoping we will hear news on The Rocks Black Adam movie and also the next entry in the Arkham series or Rocksteadyʼs new DC video game. Overall itʼs a great time to be a DC fan. And with that, another edition of Confessions of a DC Geek comes to an end. I do hope that you have enjoyed reading Davids’ confessions, I certainly did; a fine way to get to know our readers that little bit better. My sincere thanks to David for agreeing to participate and confess all, always very much appreciated. Twitter: @DC_ComicsGeek or @_DCWorld / Email: john@dcworld.org.uk. I hope to hear from you at any time. Until next time, always remember: It’s not who you are underneath but what you do that defines you.